South Africa finds itself at a complicated crossroads of its energy development, and the direction many signals point towards force a questioning whether current and past experiences are lost upon the decision makers deciding the energy and economic fate of their nation. Similar to sticking your face near the murky waters of the Limpopo to verify if a crocodile lies on the river’s bottom, so too is the precarious nature of discerning whether South Africa will lock a substantial portion of its economic future into the hereunto delivered promises of nuclear power at a cost of 1 Trillion Rand. The numbers alone, originally estimated at USD $10 billion, shortly thereafter rising to 5 times that amount, and now sitting tenfold higher before any ink has dried, speak for themselves. It is almost a blatant absurdity that South Africa would pursue Russian nuclear at this cost, and there is limited evidence an energy project of this magnitude would begin to come online by 2023 as promised. 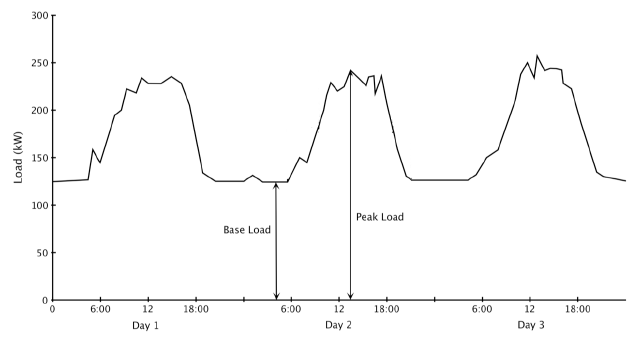 Electricity Load [Demand] Curve over 3 days. This is very typical of most electrical systems around the world. Demand (consumption of electricity) rises during the day when people are awake or at work and falls during the night when people are asleep and businesses are closed. South Africa’s two newest coal plants, Medupi (4.8 Gigawatt) and Kusile (4.8 GW) themselves are years behind schedule. They are prime examples of how few large scale generation projects achieve full capacity on time and within budget, where Africa graces few newspaper headlines in breaking the model for the better. As though the stings of endemic load shedding were not enough, South Africa itself is home to two panacea solutions for the Southern African Development Countries (SADC) energy woes that have become headaches for all involved. By Eskom’s own admission, the accounting for both coal stations is not easily delineated from the generation, transmission and distribution utility’s overall operating budgets, however good evidence points towards an ultimate completion price of USD $40-50 billion, without repayment interest factored in. This alone is one-half the completion price for an equivalent generation capacity to be built under the nuclear scheme. Which begs these questions if South Africa just followed current coal schemes. How much domestic coal could be purchased? How many direct and indirect coal sector jobs could be ensured? And, how much domestic economic production could the extra ~USD $50 billion purchase during the years waiting on the Russian nuclear plants to come online? The recent push for small modular coal generation, under Independent Power Production (IPP) agreements, is clearly a reaction to mega coal generation project failures to meet schedules and costs. Less so, the doubling down on coal is an effective statement as to South Africa’s apparent limited concern to the long term effects of increasing carbon dioxide emissions. Electricity Load [Demand] Curve Daily with Comparisons Across Seasons. Although this is for the UK, average lows, called “Troughs”, and average highs, called “Peaks”, typically vary predictably by season. National Grid’s system based on load is not much larger than that of South Africa’s Eskom, however with diversified generation sources and sufficient capacity (max amount that can be generated), the “Peaks” at National Grid are actual system demand (how much is wanted). When “Load Shedding” happens, actual demand is higher than generation capacity available. In South Africa currently, capacity is about 40,000 Megawatts (40 GW), which means all the load peaks above 40GW are “cut off” or “shed”, hence the term “load shedding”. The important thing to remember, electricity is does not want to be “stored”, it wants to be used as soon as it is made. When demand falls, supply must follow, otherwise that electricity is wasted, thus any fuel used to make it is wasted too. Because fuel costs money, no generator wants to make more electricity than is needed and can be purchased. Fuel types have different costs and different rates at which they can “ramp up” from zero to producing, and “ramp down” from producing to zero. Natural Gas or hydroelectric can ramp up & down very quickly, following changes in demand. However, nuclear is very costly and slow to ramp up & down, hence operators prefer to run nuclear “8760” (industry speak for 24/7/365), and it is best to use in the area of the demand curve below the anticipated daily “trough” or “base”, hence the term “base load”. The global energy landscape has changed dramatically in the 10 years since Medupi and Kusile were first envisioned, whereby the best information and technology of the times was decided upon. Even Germany, with its meticulously planning, found itself on the wrong side of technological advancement with a new fleet of coal generation coming online as renewable production soared. However, in addition to shuttering nuclear, a bit reactionary after the Fukushima disaster, they [Germany] are closing natural gas (NG) generation to diversify away from dependence on Russian NG, and their domestically sourced coal operations are in decline, not growth. The need to heavily subsidize wind or solar was arguably a necessity five and ten years ago, however today, the cost effectiveness of renewable energy schemes is increasingly well recognized within a new global energy paradigm proving itself. Instead of capital being expended to allow the industry to grow, the capital is being converted into actual watts of electricity on the backs of an established manufacturing industry and supply chain, as well as reductions in capital devoted to R&D or government subsidies that were necessary prior to renewable energies reaching break-even thresholds of economies of scale. Are there extenuating circumstances that may be driving South Africa’s energy policy against the currents converging and gaining strength in the global energy landscape? I believe there are, and they may be the reasons the second largest economy on the African continent is sailing in the opposite direction. S. Africa’s 85-95% reliance on coal for electricity production stems from the domestic abundance of it, and a generally accepted prudence in limiting capital export for the purpose of fueling significant energy needs. This reliance, in turn has spurred the growth of the coal industry itself and jobs are dependent upon it. However, this high reliance on a single industry and energy source can also cause problems when conditions change, as they always do. And the global coal market did just that over the past year. South Africa was hit three ways as a result. Global coal prices dropped on declining demand, notably in the U.S., but also as the furious pace of new Chinese coal station builds has plateaued. As a result, South Africa faces lower demand for its higher quality export coal and declining influx of foreign capital it would receive for it. The global coal giant Glencore, with operations in the tip of Africa, shuttered operations at the Optimum Mine citing the soft global market for coal. Any difficulties or constraints in SA’s Transnet [electric] Freight Rail system would only facilitate Glencore’s decision given the 400 km to the export facilities at Richard’s Bay. Load shedding has of course been endemic throughout Southern Africa, and Eskom’s ~45 Gigawatts of generation capacity has not been immune to the region’s electricity woes. To make matters worse, South Africa’s domestic coal fleet is not configured to burn the higher priced export quality coal, but to keep coal mines open and workers working, it is being fed into the boilers at a direct economic loss as well as an efficiencies loss too. Eskom signed agreements for this “domestic” coal to the tune of USD $318.5 million in March. Glencore is not the only global coal producer in South Africa; things may only get worse as coal loses prominence as the default source of electricity production around the world regardless of an overall need for more electricity. Coal is seeing intense competition from natural gas, and as renewable energies such as wind and solar PV prove themselves, they will take up any and every decline coal experiences as they exploit base load generator’s need for daytime and peak demand premiums to offset nighttime losses from oversupply. The difference between fuel costs, solar and wind having none, allows pure economics to drive the process more so than any regulations to counter concerns over climate change. Whether those fears are real or imagined doesn’t matter, zero cost for fuel will win this battle in the long term. Nuclear energy advocates have said is so cheap; there is no need to meter it. There are few who believe that line anymore, but that doesn’t stop the nuclear industry from repeating it. Except for, this time around, cost per gigawatt of capacity doesn’t appear to be relevant. At twice the price of an equivalent capacity of South Africa’s two new coal stations. Maybe someone added an extra zero by accident? Regardless the price discrepancy, new nuclear stations in South Africa were political non-starters in the planning departments of Eskom, and SA’s Department of Energy (DoE) launched this escapade into nuclear contrary to public will in opposition to it. Nuclear directly competes against the domestic coal industry, providing fewer long term jobs, and nuclear only diversify SA’s energy mix further towards higher base load predominance. Few advanced electrical systems world-wide lock themselves into such high dependence on baseload generation, as demand is rarely static, not to be confused with increasing need. Koeberg nuclear station in Cape Town, and its capacity of 1.8 GW, demonstrates that nuclear is, no ifs, ands, or buts, a base load electricity generation source. Coal stations themselves, lose money when they are ramped up or down, to closely match real time energy needs, thus with an addition of new nuclear capacity, South Africa is building their existing 45-50GW capacity system towards 100% base load generation. This will further exacerbate the reality of daily and seasonal electrical demand cycles, not moderate them. The pumped storage schemes at Drakenberg and Ingula in KwaZulu Natal, and less so Palmiet outside Cape Town, will only go so far to “fill the trough” of night time oversupply of electricity from base load generation schemes, in an ultimate losing scenario to store cyclical unneeded capacity. There is little inkling batteries, not those in people’s homes and businesses to try to moderate the effects of load shedding, but those as a national energy policy to address issues of variability of the renewable resources of solar and wind, will be deployed to compensate for fluctuating demand. Regardless the industrial, commercial and residential mixture of demand the world around, no electrical system plans around a straight line for electricity needs. Wheeling electrons to neighboring countries through the Southern Africa Power Partnership (SAPP) transmission system will not benefit South Africa either. No national economy can operate and grow on intermittent supply. What good would Eskom’s oversupply in the night time do for Botswana, Namibia, Zambia or Mozambique, if they cannot match it during the daytime on their own? What about natural gas, isn’t it storming the world elsewhere? Variable “firm” capacity natural gas (NG) turbines, used heavily in the United States and the primary cause of coal generations decline outside of regulatory mandates, with quick ramp times, are not being pursued in South Africa. To the contrary, flexible turbine capacity and grid system reliability is being designed and implemented with regional, coastal diesel fired open combustion single and combined cycle generators. Why diesel in a nation more intimately aware of its higher costs over NG? The answer lies in the global leader of coal-to-diesel and natural gas-to-diesel technologies, none other than the homegrown Sasol Corporation. Even though natural gas exploration and production (E&P) is nascent at best within South Africa, use of NG is not hampered by any “protectionist” policies against energy import. To the contrary, NG is coming in from Pande development in Mozambique through pipelines built, financed and operated by Sasol, to produce diesel and other products at their refineries. As such, lower cost variable production through NG turbines is forgone in favor of costly diesel fueled generation, and as can be expected, its use for electricity generation comes at an absolute last resort, where load shedding itself is often employed instead. An electric meter not spinning, in other words not generating revenue, may be better than one spinning at a loss, which could be the economic reality with diesel fired electricity. A second USD $6 Billion pipeline out of the north of Mozambique to Richard’s Bay is also being pursued, but dedication towards variable firm NG turbine electricity generation is not confirmed. Whether available natural gas will help alleviate SA’s energy woes is up in the air, but not promising by any accounts. Yes, arguably it has arrived to South Africa’s extensive grid system. But to put it bluntly, red carpets were not laid out to welcome it. After enough battles were waged to tap into the few available “sockets” at Eskom’s substations, and some needed transmissions links were built to access the “Solar Park” in Upington, Northern Cape, allocations for new capacity bids have declined from the first rounds. And this is even with the acknowledgement; the costs were dropping through each new round. An artificial limit has been placed upon wind, solar PV and concentrated solar power (CSP), regardless the builds are coming online within budget and schedule. Eskom transmission planning documents reveal the national energy policy’s conventional wisdom, “renewables are not base load generation sources”, and one can see the negative impacts of this misguided belief, whether an aversion to regionally accessible natural gas turbines or IPPs for small scale coal. 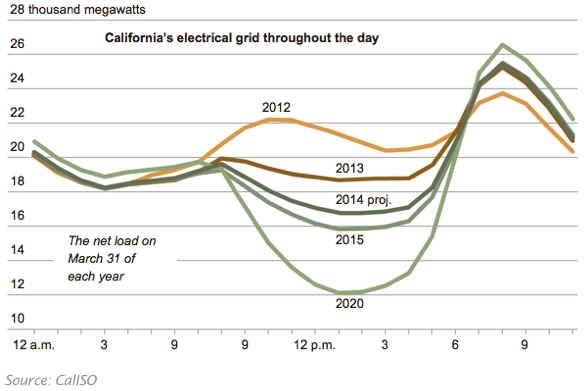 1-Day Load Cycle California ISO – “The Duck Curve” – Why might wind or solar not be considered “baseload”? Because individually, they are variable, they are not “firm” or guaranteed capacity 8760 and system operators, just like you or me, like givens and certainties, it’s just makes life easier. Solar capacity peaks when the sun is up, similar to when demand increases and falls when the sun goes down, but it doesn’t match people’s habits perfectly and clouds do cause production to decrease. It is not simple to predict, but it is not impossible either, and more can make that predictability easier. What worries baseload generators more than anything, is what you see here as more PV is installed, system demand decreases more and enters “baseload” production. When there is a fuel cost, as there is with oil, diesel, coal and yes, even nuclear, but not with solar or wind, electricity greater than demand is being wasted. System operators have to control this as too much electricity can also cause problems, and generators are “unplugged” from the system. Depending on ramp speeds and fuel costs, if you are “unplugged” you may have to keep generating but you cannot sell your extra electricity either. In electricity markets, Eskom is not a market, extra supply causes prices to fall, not enough supply causes prices to rise, and trading happens. Wind and PV can cause extra supply, so much so that “negative pricing” happens on markets meaning a generator will not be paid for that electricity. And this is where fuel costs make a difference. If in this example, baseload generation is 16 GW in 2014 when lowest demand is 17 GW, no problem. However in 2020, baseload at 16 GW, but demand drops to 12 GW because of PV, that means 4 GW of baseload capacity is being wasted. Who’s capacity doesn’t matter to PV as they have no fuel cost, but any other generator with a fuel cost will be losing money. The reality is, this $100 Trillion Rand nuclear proposal, with an overly optimist projection for the first few gigawatts of production in 2023 does little to alleviate current endemic load shedding woes and associated losses to current domestic industrial and commercial activity. Too many current domestic realities, mid and long term projections, a globally evolving energy dogma and more translucent economic considerations are being glossed over to facilitate this Russian nuclear development in South Africa. Anyone able to arrive at a substantially different conclusion must be counting on an historical “certainty” of murky African transparency to justify their accounting. Will South Africa stick its face to the water knowing the Croc is there even though all cannot see it? Or will they avoid the risk all together, knowing the result will be the same, regardless the physical action required to prove it? I am hoping for the latter. Source articles used to compile and validate this perspective can be found here. Reblogged this on Opubo's Blog. Thank you Enrique. What I found in some earlier documents during prior to the 1st round was extensive searching for existing bays & connections at existing substation. And identifying capacity limits on transmission. Then come approving bids it went into snail’s pace. One thing that was clear, Eskom & apparently DoE, doesn’t consider wind, solar or CSP baseload, and I don’t think that sentiment is rooted in protecting the domestic coal industry. It’s just misguided at its heart, and maybe the REs were just a consultation prize in the hopes they will fail. I just saw the same ‘baseload’ requirement language regarding the 10MW hydro project up on the Orange River. Any desert river raises concerns on meeting consistent flows from my perspective being from the western U.S. Even the Zambezi is in drought status, 50% flows at Kariba now. But thanks for your comments. Please substantiate why baseload requirements are not important in the SA context. When running long powerlines from the oalfield stations to the furthest coastal areas, base load becomes crucial in having a stable grid. Transmission line limits and capacitance over large distances all play a role in the need for base load. The Klipheuwel wind generators proved that wind cannot be see as base load but can contribute towards the energy mix. Green energy with zero fuel cost still have maintenance and initial costs versus capacity to consider. Strange how that is hardly mentioned. I have personally synchronized generators onto an unstable SA grid and know the benefits of base load first hand. Because, quite simply no system needs 100% base load generation to keep it functional and efficient. You answered yourself I do believe…. Because generation concentrated so far from load centers, all the reliance comes from having ever increasing numbers of transmission lines of ever increasing high voltage capacity. Continue to chase a model of generation concentration away from load centers, and the problem exacerbates itself with increasing congestion and increasing pinch points. How many 275s, 400s and 765s will be needed out of Marapong? I can count at least 10. How many from Beta/Perseus to CPT? 5 or 6 so far. I do apologize, I was unable to write about the SA’s Grid & Transmission in this piece (too many words as is), but that is also a self-fulfilling addiction. As will be SAPP, where some member countries are chasing “wheeling” opportunities instead of capacity building. As to your point on necessity of baseload for long distance capacitance, that is where Reactive Compensation & SVCs come in.. and yes they can/do offset for limitations coming from behind DC inverters at wind or solar farms. Capacitance is not 100% necessary, it is somewhere between 0 & 100, distance from generation to load causes the need for more. But if it is a limitation due to wind & their DC inverters, as you alluded to, what capacitance comes out of the HVDC line from Mozi? Or others in SAPP? South Africa and certainly Eskom has never planned 100% baseload. Where does this idea come from. The baseload capacity in South Africa at whatever percentage of supply is aging and need urgent replacement. If we promote 100% green energy we will be bankrupt in no time. Please provide proof that 100% solar and wind can work for South Africa. I dont need to be taught on the grid I understand fully as I used it and saw the destabilisation over 4 years since 2002 in the control room where I was in charge. No one in South Africa is against green energy. No one working at Koeberg is against green energy. They in fact promote it. The practical implications are far more complex than you are mentioning in your article and could create a skewed understandibg with the gullible public out there. I can get very technical if I want to but who is the audience. I have never argued that 100% solar and wind is the answer, so cool your jets a bit please. But I did argue that 100% coal & nuclear is a very bad option as well. And I would argue that concentrating all the solar & CSP in Upington is likewise a poor choice. I would further argue CSP [fancy & expensive storage] is not needed at this time in SA, given existing dispatchable coal and nuclear capacity is so high & system demand drops at night, where ramp up/down costs are high, thus running coal & nuclear at full capacity is best. This is the “base load” I am talking about, everything below daily cyclic lows coming at night. I won’t go into much more detail as well, but if you continue to argue extreme positions to counter arguments I am not even making, this discussion will not go anywhere. And as you say, South Africans are desperate for energy and load shedding isn’t doing any favors to your system infrastructure or the nation’s economy. I’m not here in an effort fight over extreme positions, I’m here to draw light to those extreme positions regardless of side, when they don’t bring the energy promised or needed. Few, if any advanced nations/grids of similar size to SA & its demand loads, rely on 90+% of their supply from “base load” coal & nuclear. And I might even be willing to share who they and how they do it. I believe that at least 70 base load is necessary in SA. I also believe that green energy is the way to go as long as it is practical. SA has huge challenges with regards to infrastructure that is both costly and sensitive. The corrosion from the ocean winds from the tip of Africa corrodes aluminium in 2 years. Have you read the Eskom internal reports on the Klipheuwel wind generators. The IPP suppliers if wind farms will soon realise that this is Africa and things are different. You have to learn from experience and adapt or die. Well, obviously I wouldn’t have access to Eskom internal reports, but there are others available, that if one combs through enough of them, one can get a good sense of the land. You might even be impressed at the accuracy & detail of the grid, substation & generation map I’ve built for all of SAPP. 😀 So I’m not just slinging surface #s from some outside global reporting house <– which I set out to prove accurate or woefully lacking. I can't attest to the quantity of any one generation asset, ie wind farm, but well aware of the sentiment towards quality of consumer goods imported from same origins. But I did read in 'internal' planning docs 'renewables were not considered base load' & after a relatively forthcoming accounting of existing bays/busbars at subs was issued, a lot of foot dragging did happen to approve bids/projects. I highly doubt this will happen for the new bids out for 'fast build modular coal' IPPs and the new SCGTs inside Mozi to supply MOZAL caught me by surprise at how fast they were built & online! Why should SA see renewables as baseload? Why is there a problem with SA wanting to replace current baseload capacity considering the aging baseload stations. Peak load in 2005 was more than 36000Mw in winter. Eskom cannot even supply that 10 years later. We can replenish the old fossil stations with new baseload and still ad a significant increase in renewable energy to the grid. What is wrong with the plan. There are some serious misunderstandings at play. The green energy suppliers are not always playing open cards with consumers. The many flaws are not highlighted like the amount of energy used to manufacture a solar panel and then the issue of waste at end of life. Just like with nuclear many issues are only addressed after the investment was made. Have you even read the article I put together? Seriously? Because out of about 30+ paragraphs, talking about all the other factors at play, plus 3 very long “image notes” to ensure no gullible reader was hoodwinked into just buying into any tech without the necessary technical background…. I added 2 paragraphs total about RE and I didn’t exactly herald them out as a panacea solution. It’s not in my best interest to waste time debating you on issues I did not bring up in the first place, nor draw undo attention towards. I’m talking about system “flaws” based on old “best practices” that have evolved into new “best practices”. If you want to continue debating merits/demerits of single techs, I can’t help you and not willing to engage in that debate as it lacks a pathway to any solutions to achieve energy security for South Africa. My problem is that people that have not worked in the power generation industry are writing articles and promoting ideas with no real background or substance. The shadow minister of energy in SA will be reading your responses and will be learning a lot from them. 1st sentence – If that is in direct reference to me, then you would be mistaken. Many energy industry professionals around the world respect my perspectives and that I cut through the BS to get at the heart of the problems, and we have agreed to disagree on minor issues that have nothing to do with power system operations. But form your opinion of me however you want, they are your words, not mine. My words are in the article, and I have not seen much “substance” from you to disprove them. 2nd sentence – I can’t tell if that is a derogatory statement towards me or “the shadow minister of energy in SA”, but I didn’t write it, it is not my concern. I do not have to present anything of substance. I am an advisor to the shadow minister of energy in SA. I have 20 years active experience in the energy sector and know the SA needs and complications extensively, even the ones not prive to the inexperienced in our market. My comments are not against you. I find your writing interesting. I really mean that the shadow minister of energy can learn from your article and responses. I achieved my objective. Thank you. You can find my profile on Linked In if you are interested. Just to ease your understanding. I believe in renewables. I believe we should avoid nuclear at all cost if possible. I am trying everything in my power to stop the Russian Nuclear deal. I do not believe that SA has the expertise and capacity to run nuclear at this stage. I do believe we need more base load than renewables, and no, base load and renewables don’t mix in one sentence in the SA context. Many reasons for that. We need good solutions and many greedy companies are vying for those contracts. This is a bad time for SA energy. We don’t have time on our side and yet we cannot hastily go ahead with base load procurement. Renewables need to fill the gap right now. Then we need to change our grid. This is almost impossible in Africa. Cable theft is all I need to say. Please give me your solution for SA.